Basecamp exudes the playfulness and optimism of a young family with a palpable sense of adventure. The concept that guided the project refers to pausing at a base camp before ascending a mountain. This retreat was conceived as a place to recharge between milestones in life. The spatial organization allows one to reorient and reconnect with nature between activities. Basecamp provides distinct zones while blurring boundaries. The project accommodates the active lifestyle of a family of seven. The retreat sleeps 18+ people and provides a setting where the couple can balance work and play. Basecamp is used as both family get away and as hosting space for their clients from around the world, allowing people who would normally meet in corporate board rooms to build consensus in an inspiring setting. The interior palette of durable natural materials and exposed structure complements, instead of competing with, the surrounding landscape. The starting point for the concept was to create a camp with separate cabins for distinct purposes, including living, sleeping, and playing. In the process of programming and site planning, it became apparent that it would be more effective to consolidate the cabins into three unique yet connected zones, allowing for autonomy and acoustic control. 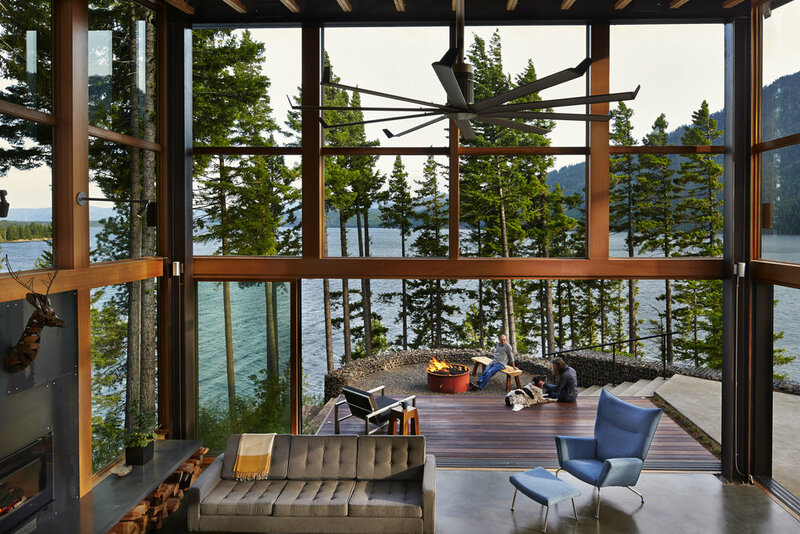 The circulation spaces provide opportunity to reorient oneself with Cle Elum Lake while moving between activities. Within the living block, spaces are arranged along a view axis that step down from the kitchen to the hearth and onto the outdoor fire pit and water beyond. This enables a visual journey between spaces and creates a comfortable, compelling sense of prospect and refuge. Although the functions are separated into three distinct blocks, Basecamp plays with boundaries: indoor and outdoor space runs together through the use of gabion walls on the interior and window walls; multi-functionality blurs the separation between work and play; the kitchen island is reinvented as dining table and the dining room is often re-purposed as conference room. 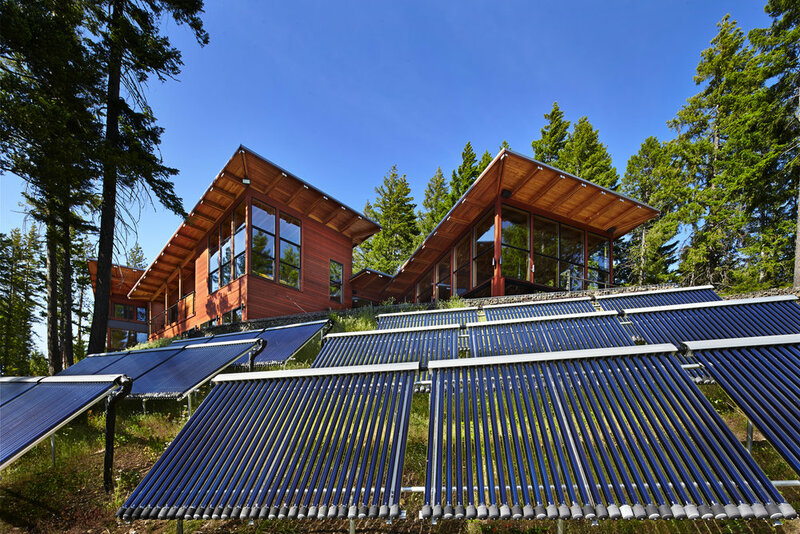 Sustainable strategies include low tech elements such as solar hot water collectors contrasted with high tech home automation systems that allow the owner to control temperature and lighting with iOS devices. Basecamp achieves efficiency through a consolidation of work and play and an appropriate use of technology. It celebrates the journey of a family with five energetic boys and provides the backdrop for pause or milestones. It is a place to recharge both before you set out for the summit and upon your return.